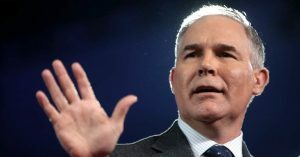 Environmental Protection Agency (EPA) head Scott Pruitt argued in at least two recent interviews that green groups, scientists, and other advocates working to slow the climate crisis are “arrogant” in saying that humans should work to keep the earth from warming. Pruitt put forth a similar argument while speaking with the New York Times last week, leading to a rebuke by journalists including Emily Atkin, science and environmental reporter for the New Republic. Climate scientists have put forth a number of possible scenarios should the earth continue to warm in the coming decades. As Common Dreams reported in December, a study by the Carnegie Institution for Science found that there is a 93 percent chance that the Earth will warm to a dangerous degree—more than four degrees Celsius or 39 degrees Fahrenheit—by 2100 if greenhouse gas emissions continue at their current level. In his interview with News 3, Pruitt also brought up the idea of holding “honest, transparent debate” between climate scientists—97 percent of whom agree that human activity is contributing significantly to global warming—and people who disagree with their assessment. The debate would allow Americans to “be informed and make decisions on their own,” Pruitt said. Pruitt’s suggestion that climate crisis may help humans to “flourish” instead of causing drought, famine, perilously rising sea levels, and other harmful effects that experts have warned of for years, is only his latest attempt to deflect from green groups’ push to protect the earth from the carbon emissions that cause warming: a year ago, the EPA administrator denied climate crisis existed at all.